BRAND NEW Version 3.0 compatible with ALL printers ! I bought Brother LC 233 compatible cartridges. They were half the price of the cheapest ink at Officeworks..........so, I purchased 2 sets and received free postage. Very happy with the product and happy with everything from placing the order to super fast delivery. Highly recommend Ink Hub. Great value and Great service. 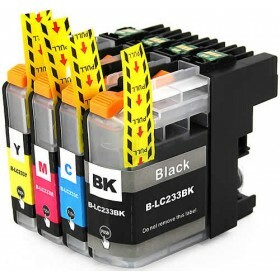 Brother LC233 cartridges at basically one quarter the price of the genuine brother cartridges. They print very well so why pay the huge price for the brother ones. Somebody's making a hell of a profit ! Congratulations on a well laid out website. I found my cartridges fast and the whole order process was very simple. Cartridges arrived the following day in the afternoon and they were packaged well. The inks worked and the print quality is good. I am happy with my dealings so far. Great service and price ! Happy with the speedy delivery and price. I purchased these inks on 11th of October at 2.00pm online. Had them in my printer by 11.30 on the 12th of October (next morning). What more can I say. After phoning Ink Hub it was a fast delivery to Maitland, Yorke Peninsula. Try finding ink cartridges anywhere on Yorke Peninsula is almost impossible! Delivery was within 2 days and the price (including delivery) was no where near the price of the local Newsagents. A great business and even better prices. Fast Delivery and installed without an issue. I have had no problems with these generic inks, will keep coming back at this price. These work perfectly in my Brother MFC J880DW. Bought my first lot on ebay but couldn't get them to work. Good value and service! Great value, these generic cartridges are one third the price of the Brother LC 233 cartridges. So far they work perfectly in my printer. Fast Delivery and great service. I rang Ink Hub initially for advice on an issue I had with my Brother printer and they were very helpful. I have been buying my ink from them ever since. I highly recommend this company.